What an incredibly wonderful day I had today. This morning I had the pleasure of being a participant in the vaginal birth of breech twin girls. This is not at all common and needs to happen in the hands of a skilled provider and an excellent support team. The birth was lovely and everything went very smoothly. Later in the day, I shared in another wonderful birth of triplets. 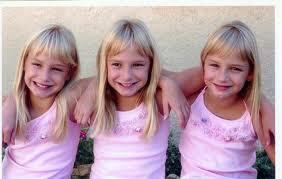 The babies were spontaneous triplets which means that they were not conceived with the help of fertility treatments. They were born by cesarean section and each baby weighed four and one-half to five and one-have pounds. I so love my job.